You can actually do it easily If you want to make your own eyelet curtains and are pretty handy with a sewing machine. This type of a curtain is not only easy to install and use, it is also very simple to make and all you will need is the fabric you will be using for your curtains, eyelet headed curtain tape, back rings, a sewing machine, a pair of scissors and the curtain pole you will be using for these curtains. You will begin this simple job by measuring and cutting out the fabric according to the window that you will be using it on. Make sure you have one curtain for each side of your window. When you measure the width and the height of the curtains, make sure you leave allowances for the hem and the edges that need to be sewn. After sewing the hems and the edges of your curtain, you will then need to attach the eyelet curtain tape to the curtain's top edge. Make sure to follow the instructions that come with this eyelet tape. Cut out the holes in the middle of the eyelet rings and attach the back rings to these cut out eyelets. Secure these by making sure that they clip on properly. You can then thread the finished curtain to the curtain pole you have for your window. You will discover that since it is so easy to make this kind of a curtain, you can easily change your curtains whenever you want to change the look of your room. The look your room has will depend on the kind of fabric you use for your curtains. If you want a more feminine appeal, you can use floral fabrics. If you want a more masculine look, you can use dark solid fabrics or fabrics with geometric shapes. 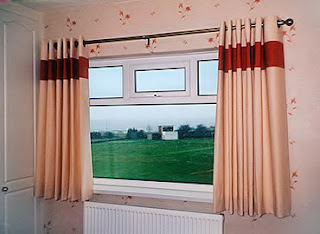 You can even make curtains for you whole house using this simple technique and you can save a lot of money by doing so as well.